A more cute first Christmas ornament we can't imagine. The artist captures the wonder and thrill of a new arrival in this baby's first Christmas ornament for a baby boy. 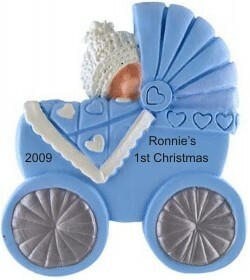 We will personalize the handcrafted ornament with the year at your option. Next, include your custom sentiment on up to 2 lines as shown. The resin ornament for kids measures 3.8"H, and includes our holiday cord for convenient hanging. To complete the presentation, the Christmas tree ornament arrives nestled within our exclusive black velvet drawstring bag, ready to make a great gift for a special young boy or girl.